Garcia-Diaz M, Bebenek K, Sabariegos R, Dominguez O, Rodriguez J, Kirchhoff T, Garcia-Palomero E, Picher AJ, Juarez R, Ruiz JF, Kunkel TA, Blanco L.
DNA polymerase lambda, a novel DNA repair enzyme in human cells. J Biol Chem. 2002 Apr 12;277(15):13184-91. 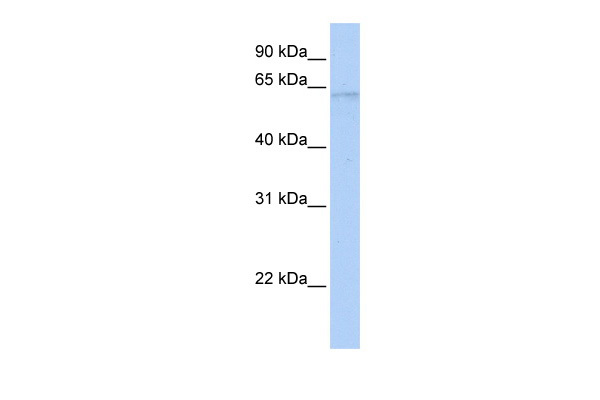 Western blot analysis of extracts from 293 cells, using DNA Polymerase lambda Antibody. The lane on the right is treated with the synthesized peptide. Western blot analysis of POLL Antibody (C-term) Cat.-No AP53380PU-N in HepG2 cell line lysates (35ug/lane). POLL (arrow) was detected using the purified Pab. 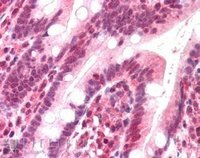 TA305748 (5ug/ml) staining of paraffin embedded Human Small Intestine. Steamed antigen retrieval with citrate buffer pH 6, AP-staining. 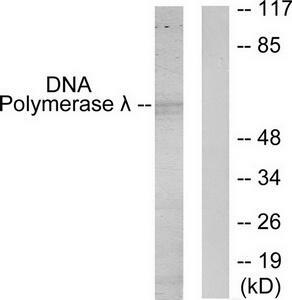 Western blot analysis of extracts from 293 cells, using DNA Polymerase ? 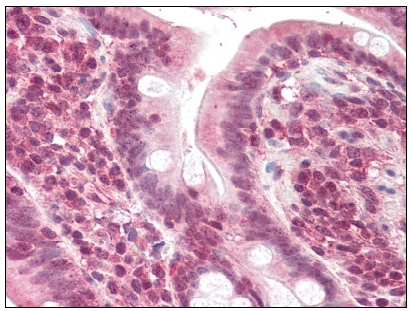 antibody.The lane on the right is treated with the synthesized peptide.